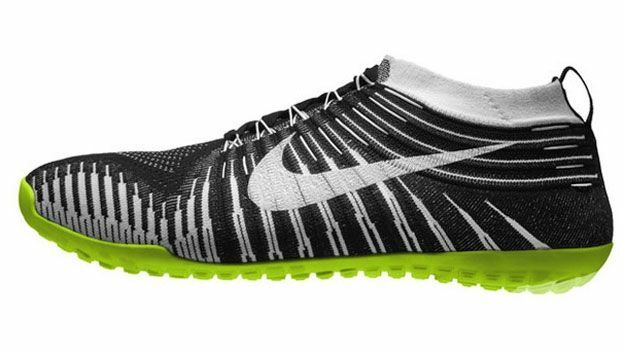 Nike today introduced a brand new nearly-barefoot running shoe that aims to deliver a ride so natural and comfortable that you could be running in a sock. The Nike Free Hyperfeel was unveiled along with the new Nike Free Flyknit running shoes at a launch even at the company's Portland headquers. The new shoe is designed to mimic the intricate workings of your foot with Lunarlon foam to replicate cushioned pads under the foot while the outsole protects like hardened skin on the sole. Dynamic Flywire flexes and contracts with movement inspired by ligaments. The shoe design and technology is based on a new principle Nike is calling 'nature amplified'. It's the notion that technology in sports needs to enhance the body's natural capabilities, cutting out anything that's not completely essential to delivering optimum performance. Harking back to Nike co-founder and Oregon Track & Field coach Bill Bowerman's original shoes that were created when he poured rubber into his wife's waffle iron, the Nike Free Hyperfeel is structured on a waffle outsole that is reengineered with strategically placed pistons, reflecting key pressure points. Highly durable XDR rubber is added in high-wear heel areas. The in-sole is created from the same articulated Lunarlon foam you find in the Nike Free range, but here it is the only intermediary layer between foot and outsole — minimal layers for maximum sensation. Meanwhile the one-sheet Nike Flyknit upper provides a compression sock-like fit, delivering support where needed but without adding unnecessary weight. Nike Flywire cables lend additional support to help lock the foot down. The upper's seamless construction significantly reduces the number of shoe components: A typical Air Pegasus running shoe is made up of 57 components while the Nike Free Hyperfeel has just seven. Nike Free Hyperfeel Release Date: The new minimalist running shoes will be on the shelves in the UK from September. Nike Free Hyperfeel Price: The UK price is yet to be confirmed but in the US a pair of Hyperfeel running shoes will cost $175 or around £115 based on current conversion rates.